Land Rover released official information of the new Defender 2007, probably after some leaked spy pics surfaced on the internet recently. So now there really in no more speculation. The changes to the new Defender are all on the inside, except for the slightly modified bonnet for the new engine. These changes are the most significant since the introduction of the Defender in the form of the 90 and 110 models. The last major change was the introduction of the TD5 engine, but even that was not accompanied by any major internal or external changes. The Defender gets a new 2.4l engine from Ford, new six speed gearbox, new integrated dashboard, more comfortable seats and new forward facing rear seats in the 90 and rear of the 110 and an improved heating and aircon system. All of these changes have been aimed at improving the driveability of the Defender to make it a bit more refined. The fact that nothing was changed on the rest of the mechanics and body just goes to show how iconic and functional this design is. For the purists it will mean a blow to the functional no nonsense interior, but for the majority it will mean a more driveable and liveable vehicle which should see it last until 2010. So once again the Defender essentially survives the SUV onslaught despite all the pressure and speculation. Greater ability both on-road and off-road plus increased comfort, performance and refinement are among the major improvements introduced for the Land Rover Defender for 2007. A new 2.4-litre diesel engine offers increased torque and improved driveability while the new six-speed gearbox provides a lower first gear ratio, for better off-road control, and a high sixth gear for improved cruising refinement. 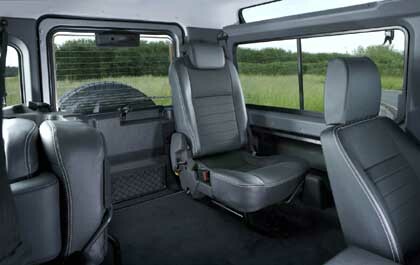 Inside the vehicle, a new facia improves ergonomics, whilst new seating improves comfort for all occupants, from the four-seat Defender 90 to the five-seat 110 and 130 models. A seven-seat Defender 110 is also available. The latest in a long line of evolutionary updates to a vehicle whose roots date back to 1948 (since when nearly 1.9 million units have been sold), the 2007 model year changes maintain Defender�s relevance while enhancing its functionality, versatility and durability. Since the current model�s introduction in 2002, Defender has consistently sold an average of 25,000 units a year worldwide. Retail and utility customers, armed forces and NGOs in over 100 countries value Defender�s class-leading blend of towing and load-carrying versatility, alongside the vehicle�s extraordinary strength, robustness and capability. The unique combination of these attributes helps account for the model�s exceptionally high standards of customer loyalty. Land Rover managing director Phil Popham said: "We�re building on Defender�s success with a package of improvements that will extend its off-road abilities even further, while transforming on-road refinement and comfort. These changes represent a significant vote of confidence in a product which is the foundation of Land Rover�s reputation for off-road excellence; we believe these enhancements will win the hearts and minds of new and existing customers alike." Defender�s new 2.4 litre, four-cylinder engine draws on parent company Ford�s acknowledged diesel engine expertise, and represents a major step forward in terms of refinement and driveability. Torque output is higher than the outgoing engine right across the usable rev range, and the 360 Nm (265 lb ft) peak is delivered at only 2000 rpm; over 315 Nm (232 lb ft) of torque is available from 1500 rpm to 2700 rpm. Engine peak power output is 122 PS (90 kW), with more than 90 per cent of peak power available from less than 2200 rpm to over 4350 rpm � over 60 per cent of the usable rev range. Naturally, in European markets (with high quality diesel fuels), the new engine is designed to be fully compliant with EU4 emissions legislation. 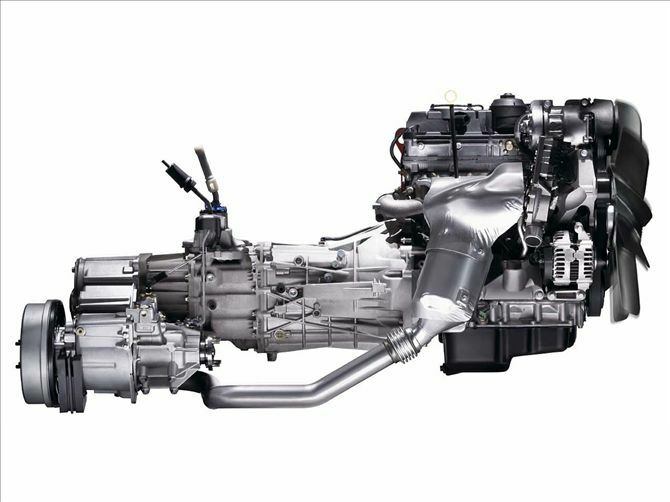 But with Defender�s status as a truly global product, a unique engine tune has also been developed to tolerate variable quality, high-sulphur fuels. Based on a cast-iron block, the engine features an alloy, 16-valve cylinder head with Denso common rail fuel injection. Not only is combustion noise dramatically reduced, thanks to the excellent control provided by the engine�s solenoid-driven fuel injectors, but a new Garrett variable geometry turbocharger also helps ensure throttle response is improved over the outgoing engine. The engine�s lubrication and sealing systems have been specially developed to cope with Defender�s onerous range of operating angles. The new GFT MT 82 six-speed gearbox provides a much wider ratio spread than before; the lower first gear offers a reduction in crawl speed and combines with the engine�s increased torque output to make towing on-road and off-road even easier. The increased engine torque also helps in-gear acceleration, and has allowed the new sixth gear to be set 20 per cent higher than the outgoing model�s top gear. This helps to improve real-world cruising refinement and fuel economy. Ground gears in both the gearbox and new transfer box help boost refinement, while reductions in clutch and gear-change loads make day-to-day living with Defender significantly easier. Individual pedal maps specifically matched to the demands of each gear are designed to ensure throttle progression and control is better than ever before; in addition, improved anti-stall characteristics further extend the vehicle�s renowned ability to tackle the toughest terrain. Changes to the vehicle exterior have been kept to a minimum, with a revised bonnet profile the only clue to the new Defender�s increased capability. As Dave Saddington, Defender chief designer points out, "Defender�s timeless exterior has become synonymous with functional design. Every line and surface seems to be linked to the vehicle�s extraordinary capability, so we deliberately changed very little. "But the interior�s a different story. We wanted to change the heating system and instruments, as well as improve ergonomics, all of which gave us the opportunity to introduce an all-new facia. In doing so, we�ve worked hard to reflect Defender�s unique purpose and versatility inside the vehicle too. The new facia is better integrated, more robust and functionally superior to the old unit, whilst still entirely in keeping with Defender�s character." Defender�s new facia is based on a single, large moulding supported on a robust steel rail to help eliminate squeaks and rattles. Instruments from Land Rover�s Discovery 3 provide clear, concise information to the driver, and details like all-LED instrument illumination help ensure high standards of reliability. Improvements to ergonomics abound � for example, a new passenger-side grab handle provides robust, two-handed support during extreme off-road driving. 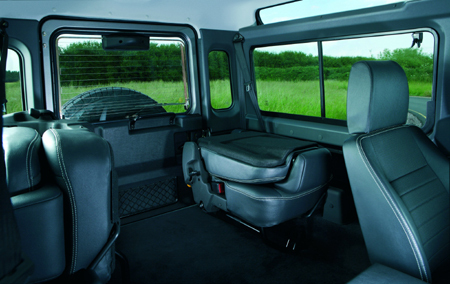 The process of modernising Defender�s facia hasn�t sacrificed its usability either, with versatile stowage shelves conveniently located for both the driver and passenger. Two console options are available: a practical open-tray design that keeps contents to hand and a large, lidded design that provides an impressive 14-litres of stowage. In-car entertainment systems have been upgraded to take advantage of Defender�s improved refinement. For the first time, high-mounted tweeters are available in Defender and work in conjunction with the new speaker installation for significantly improved clarity and sound reproduction. An auxiliary/MP3 audio input socket is also available. The new facia houses an all-new heating and ventilation system. Cabin airflow is up almost 50 per cent, with new aluminium plate and fin heat exchangers helping deliver impressive performance. In cold weather, the heater warms the cabin 40 per cent quicker than before and can achieve cabin temperatures a full 12�C higher. The air-conditioning system can cool the cabin in half the time of the old unit, and achieve cabin temperatures 7�C lower too. The addition of side window demist vents helps maintain visibility whatever the weather. Seating is also comprehensively improved. New, taller front seats are designed to improve back support and head restraint ergonomics. Robust, more supportive second row seats are introduced too. 110 Station Wagon and 130 Crew Cab models can comfortably accommodate three occupants on a new, asymmetrically-split second row seat. A spring-assisted fold mechanism helps when folding the seats for carrying large or awkward loads. 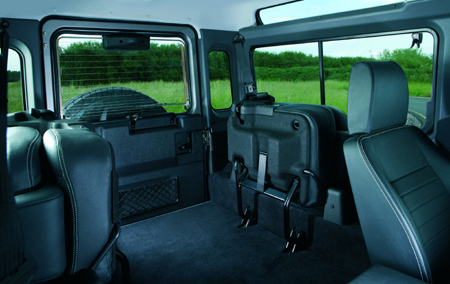 Defender 90 Station Wagon second row occupants benefit from a pair of individual, full-size, forward-facing rear seats. Providing significantly increased comfort and space over the outgoing model, these seats are also available as a third row option on the 110 Station Wagon. Accessed either through the rear door or by folding the second row seats, they can be easily folded and stowed sideways in the loadspace. Seat trims include durable all-vinyl and cloth specifications; a half-leather option is also available to add a touch of luxury to the new cabin. Three-point safety belts are specified for all seating positions. Upgraded sound insulation, the common rail engine�s excellent combustion control and the significantly higher top gear all contribute to a substantial overall improvement in cabin refinement. In the words of Gary Taylor, Defender�s chief programme engineer, "For many customers, the step change in Defender�s refinement will be one of the most welcome advances; not only are noise levels significantly lower, but sound quality is transformed too." Defender�s unique vehicle architecture has been retained. The chassis frame is available in three different wheelbases, and in both standard and heavy-duty guise (for even greater load-bearing capabilities). A total of 14 separate body styles � from pick-ups and soft-tops to crew cabs and station wagons � are produced on the mainstream production line. Beyond this, Land Rover�s Special Vehicle Operations team offer a range of products from standard drop-side or box-body conversions to bespoke design and build adaptations into ambulances, mobile hydraulic platforms and even airport fire tenders � all of which are covered by Land Rover�s extensive warranty. All photographs and engineering data in this press pack are from pre-production prototype work. The specification, design and production of any vehicle shown is subject to alteration without notice. Some images feature optional accessories. The GFT MT-82 gearbox is a Gretag Ford Transmission unit similar to that used in the Ford Transit van. Manufacturing of the MT82 six-speed gearbox for Ford Motor Company takes place at the Halewood Transmission Plant. The new Land Rover Defender was featured at the Paris motor show. On display was a cutaway of a Defender 110 showing the changes to the interior of the model to come in 2007. The Defender 2007 pics from autoweek are some of the best yet and give a birds eye view of the new Defender interior with the forward facing rear seats and the revised dash. South Africans will be hoping that Auto Africa to be held in Johannesburg in late October will have a similar vehicle on display. 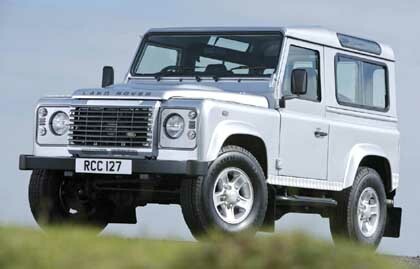 Rumour has it that the new Defender will be available in South Africa from the middle of 2007. Spy pictures of the new Land Rover Defender 2007 have surfaced on the internet. As with all spy pics you never really know what to make of them. 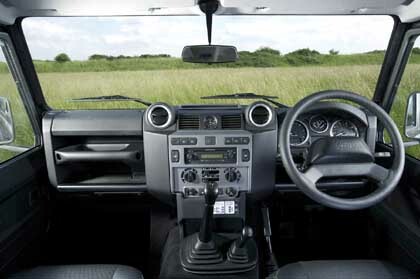 The new Defender 2007 spics consist of two pictures, one of the interior revised dashboard and the other is an exterior pic. Apparently taken by a sneaky factory worker. This appears to be the second time that info has leaked from the factory about a new model. The first being the Freelander 2 pics that made the internet just before the official launch. This is the most interesting pic and shows a modernised and an aesthetically improved dash. Structurally the dash seems to be the same straight up and down look, but it has been filled out a bit to take the edges off - probably good for safety. Judging from this pic the basic chassis will remain unchanged as the dash changes have been made to fit into the existing space. The instruments binnacle gets a rounded look, quite different from the old square look. A first glance at the exterior shows no difference at all, which kind of fits in with the concept that there is not a radical change in the body or chassis. The major difference seen in this pic is the raised centre area on the bonnet, maybe making way for a larger engine. The current TD5 is a snug fit in the existing body and with modern engines having more ancillaries to fill the engine bay space is running out. This picture is a bit confusing though because it shows a LHD, whereas the above pic is RHD. It is probably likely that this exterior shot has been flipped because the windscreen wipers are going the wrong way. Customer demand for the iconic Defender will see Land Rover release details of a new model for 2007 later this year, including a series of significant upgrades to enhance the ownership experience and meet forthcoming legislation. 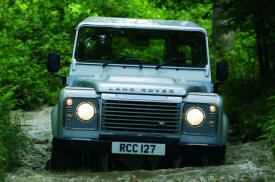 It starts going on sale next spring and will help ensure that the Defender remains in production until at least 2010. The extension to the long life of Defender, which has been in production in various models since 1948, will preserve more than 750 jobs at the Solihull factory where it is produced alongside the Range Rover, Range Rover Sport and Discovery 3. Work is also underway to see if there are opportunities to extend Defender's life beyond 2010. Annual production of Defender has remained consistent at around 25,000 units in recent years, with much of the demand coming from large contract orders. For example, the Italian energy distribution company, Ente Nazionale Elettricita, recently placed an order for over 900 Defenders. Since its emergence, nearly 60 years ago, the original Land Rover has carved a heroic path through some of the world's remotest regions and at one time for 60% of the planet's population a Land Rover was the first motorised vehicle they had seen. "With sales growth forecast in 2006, Defender remains a significant contributor to the business as well as an enduring symbol of Land Rover's 4x4 heritage," said Phil Popham, Land Rover's Managing Director. "Its simple concept hasn't changed fundamentally over the years, but it remains as relevant as ever. Defender continues to play a vital role for emergency services, aid workers and farmers around the world. As we grow Land Rover we're not forgetting our core values and our traditional customers." With a rugged ladder-frame box-section chassis and aluminium bodywork, the Defender is incredibly tough. Its practical advantages include its unmatched combination of off-road supremacy, carrying capacity and towing capability. The Defender name was introduced in 1990 but the model is a direct descendant of the original Land Rover introduced in 1948. Production of Defender and its predecessors has passed 1.8 million and it is estimated that over two thirds of them are still in use. Defender - changing times but what is next? Land Rover halted local production of the rough and tough Defender from November last year. The vehicle is still on sale here but all Defenders are now imported from the UK. 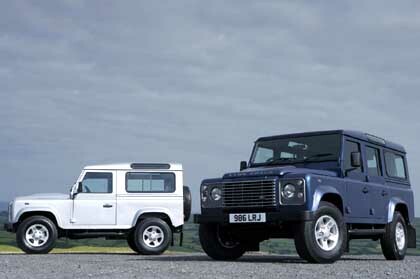 All Defender manufacture outside of the UK was halted at the end of 2005 in apparent cost cutting measures. The new Defender is supposed to be available in the US as a 2008 model in 2007. Speculation still continues as to what the vehicle will look like (see earlier reports). In a recent report in thelandroverchronicles.com a newer concept picture is presented but it is probably all part of the ongoing smoke screen. Speculation is rife that a new Defender is undergoing testing at the Land Rover estate in the UK, under extreme secrecy, no spy pictures have emerged as yet. 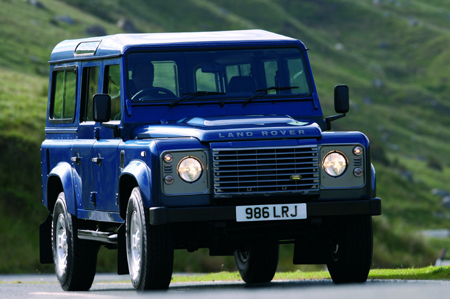 The Defender, absent from this market since after the 1997 model year, returns to the United States in 2007 as a 2008 model. It retains its image as the purest, most committed sport/utility in Land Rover's lineup, although a smaller, more basic model reportedly is in the works for introduction a year later. Land Rover is keen on cultivating the no-nonsense image of the Defender, which evokes the original postwar model made famous by the film "Born Free" and by the United Nations peacekeeping forces (before the Toyota Land Cruiser grabbed that market). The new model will remain functional and classic in design, but is expected to be a bit softer for the fun-seeking, less-affluent members of the youth market. Now under Ford Motor Co.'s wings, the next Defender will be built with a new, modern body design on a steel frame. Short-wheelbase, long-wheelbase, and soft-top versions are in the works, although not all might be bound for North America. Gasoline engines will come from Ford: a direct-injection four with variable timing, a 3.0-liter Duratec V-6, and for the U.S. only, a 3.8-liter V-6. Peugeot will supply a 2.7-liter turbodiesel V-6 for Europe. used for the new Discovery 3 / LR3 and upcoming Range Sport as Land Rover is moving to simplify its platforms from four to two. Land Rover sells 27,000 Defenders a year. Defenders replacement will need to be easier to assemble, current Defender is still very much hand built compared to new Discovery which is 60 percent automated. Automotive News did not confirm engines or any other specifications but recent reports from other sources have suggested a new inline-6 petrol and Land Rovers new TDV6. Unfortunately there are yet to be reports of petrol or diesel V8's, both are must haves for successful sales in North America. Lets hope Land Rover hasn't forgotten their promise to engineer every new Land Rover for export to North America. 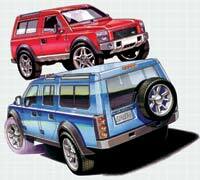 LAND ROVER, DEFENDER, RANGE ROVER, DISCOVERY, FREELANDER, EVOQUE, LANDY are all trade marks of Jaguar Land Rover. This website is for fans and enthusiasts of Land Rovers is not linked to and does not claim to represent Jaguar Land Rover in anyway.